Residential housing? Rentals? Dormitories? Condo and homeowner associations? Who is covered by what law? ADA, Fair Housing Act Amendment or Rehabilitation Act? Join us as we paint a clearer picture on accessible housing issues such as: does a landlord have to permit a service animal in a 'no pets' building? What modifications and adaptations can be made in rental units? Who has responsibility for adaptations - the landlord or the tenant? What is the responsibility of the condo or homeowner association?So many times in the workplace, accommodating employees with disabilities becomes a reactive process instead of a proactive process. 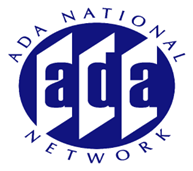 Celebrating the 10th Anniversary of the ADA, this session will highlight the best practices of organizations utilizing disability management strategies to successfully employ people with disabilities in the workplace.